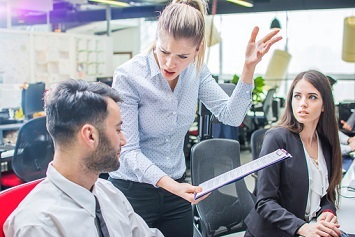 In part 1 of this article, HR Daily Advisor editor Jim Davis spoke with Catherine Mattice-Zundel, a consultant, coach, trainer, and Workplace Violence Prevention Symposium 2019 presenter had to offer about workplace bullying, including where it parallels harassment and what the differences are under the law. Today we’ll look at the importance of accountability as well as some methods for preventing bullying. She remarked that throughout the #MeToo movement, the number one strategy presented was to check your harassment policy and make sure it was up to date and make sure you are doing training. Mattice-Zundel says, “that is not harassment prevention.” It is instead a reaction. She explains that training shouldn’t be on policies; it should be on the most important aspect of harassment prevention: prevention. “The current prevention training that I have looked at focuses on prevention because of the law. Instead of preventing harassment because it’s the right thing to do.” The problem has gotten too legal, she says, and that’s part of why the problem isn’t being solved. It has to get back to the human element. Perhaps one of the most disturbing things I see when publishing content about sexual harassment is that the training often doesn’t work. From boring training videos to failure to impose sufficient consequences (or any consequences) on those who have participated in sexual harassment, training as it exists right now leaves a lot to be desired. Mattice-Zundel says that accountability lives at the center of a solution. “If you are going to train people on respect, then you have to hold people accountable to that behavior, and measure them on it, and discipline them if they step out of line.” When companies do not hold bad actors accountable, or worse, punish victims, something terrible happens. People don’t report harassment. Mattice-Zundel notes that some figures suggest 75% of sexual harassment victims do not report it. If people are not reporting sexual harassment, which comes with legal avenues, what does that mean for bullying? Companywide training around positive topics. Mattice-Zundel says that would include training for resilience, optimism, happiness, assertiveness, and to ask people to say something if they see something. “Giving them the tools to build positivity in their own lives and for each other” can make a big difference, according to her. Managers need training about stepping in and coaching behavior. “A lot of managers barely know how to coach performance let alone behavior,” says Mattice-Zundel. They need to be trained on how to create a positive workplace environment. Core values. “Your company has a strategic plan for 10% growth, culture should be in there too,” says Mattice-Zundel. Holding people accountable. Measure people on your company’s core values and on people’s incivility. Then hold them accountable with disciplinary actions when they step out of line. “If HR steps in and says they are not tolerating negative behavior like incivility,” it can make a big difference, according to Mattice-Zundel, and can help stop incivility from spreading. Strong leadership. The success of a bullying prevention program hinges on whether a leader is willing to say that he or she is no longer going to tolerate that kind of behavior. Mattice-Zundel cautions that “it’s a process, it’s not easy.” But that shouldn’t stop people from trying, she says. What if the Leaders Are the Bullies? The Workplace Bullying Institute says that more than 70% of bullies in the workplace are the bosses. I asked Mattice-Zundel what happens when the problem is at the top. “Unfortunately there isn’t much you can do as an HR professional unless you have the right kind of relationship with the right people,” says Mattice-Zundel. If you don’t have a great relationship with the CEO or other leadership, it can be an uphill battle.